How people perceive you has always been vital to a successful career. Now with the Internet, social media, and the unrelenting hum of 24/7 business, the ability to brand and promote yourself effectively has become absolutely essential. No matter how talented you are, it doesn't matter unless managers can see those talents and think of you as an invaluable employee, a game-changing manager, or the person whose name is synonymous with success. So, how do you stand out and get ahead? By drawing on exclusive research on the modern workplace and countless interviews with the most dynamic professionals, career guru and founder of Millennial Branding Dan Schawbel's New York Times Bestseller Promote Yourself gives you the new rules for success, and answers your most pressing questions about your career: What are managers really looking for? How do you create a personal brand for professional success? What do you do if you're stuck at work? 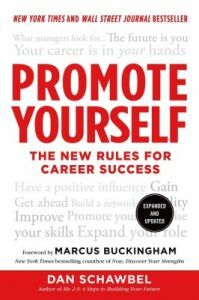 Promote Yourself frees you from outdated rules and lays out a step-by-step process for building a successful career in an age of ever-changing technologies and economic uncertainty. By basing your personal brand on the rock-solid foundation of hard, soft, and online skills that are essential to get the job done right and by knowing exactly what managers value, Schawbel provides you with the unique skills and message that you'll need today and for the rest of your career.